Stuffed Pork Chops with Cinnamon Apples make a hearty and filling meal that is a comfort food classic. It is perfect for when the weather gets chilly! Everything about this meal just screams Fall to me. 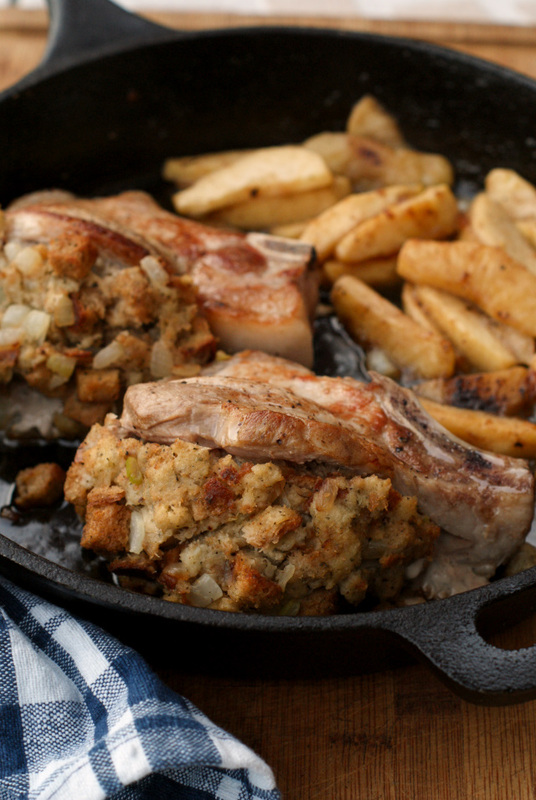 There is just something about beautifully seared pork stuffed with a celery and onion-studded stuffing and tender apples bursting with cinnamon flavor that reminds me of cool weather and comfort food. I guess that's because it IS comfort food. At least to me it is! To tell you the truth, though, I don't cook pork chops all too often. My husband prefers chicken and beef, so we go with skip the pork more often than not. This recipe ended up on our table thanks to a couple of thick cut pork chops that came with a meat package that we ordered. I'll tell you what, I am so glad that they included some pork chops this time. This recipe was a no-brainer when I saw them in our meat package and I just knew that even my honey would love them. I mean, how could he resist these beauties brimming with stuffing? I added the apples to the mix for the kids, but I was surprised at how much I loved them, too. They complimented the pork chops perfectly. 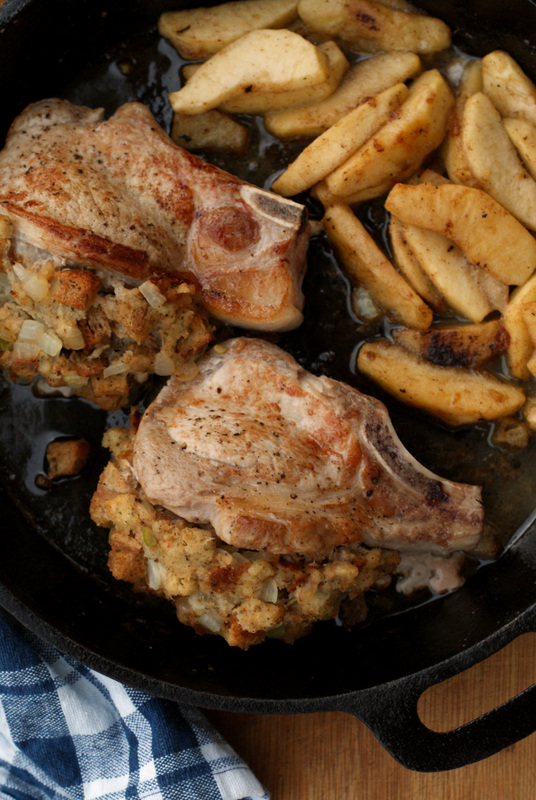 The pork chops and the apples cook in just one skillet, making them a one pan meal which, naturally, I love. I used my nice heavy cast iron, but a regular oven-safe skillet should work fine, too. This comfort food classic is welcome on my table anytime and I know your family will love it, too. Not much beats the classics! Melt 1 Tbsp of butter in a large, heavy-bottomed, oven safe skillet over medium-high heat. Add the onions and celery to the skillet, season with salt and pepper and cook for 4-5 minutes until softened. Transfer mixture to a large bowl and add the stuffing mix and chicken broth. Stir until combined and season with additional salt and pepper, to taste. Cut deep pockets into the pork chops and season with salt and pepper. In the same skillet, sear the pork chops on both sides until browned, about 3 minutes on each side. Remove the pork chops to a plate and set aside. Add one tablespoon of butter, the apples, and the cinnamon to the skillet and stir until butter and cinnamon are coating the apples. Remove skillet from heat and push the apples to one side of the pan and top with 2 Tbsps butter cut into pieces. Stuff the pork chops with the stuffing and add to the skillet next to the apples. Bake in the preheated oven for 15 minutes or until the internal temperature of the pork chops is 165 degrees, stirring the apples halfway through the cook time. Because I like to get a nice sear on my chops, I sear before stuffing them. This means that they'll be hot to the touch when stuffing them, so do it carefully! I usually use Fuji because that's what I normally have on hand, but honeycrisp, granny smith, or gala apples would be great!